Skype Voice Changer is a very simple application which modifies your voice for conversions on Skype. As a portable application, Skype Voice Changer requires no installation and thus can be executed from virtually anywhere including connected mass storage devices like memory sticks. The features of the program are rather limited but provides just the right number of options to change how you sound when chatting online with Skype VoIP. The interface provides access to creating different profiles for quick loading of different settings without having to go through the whole process of creating different voices again. For security reasons, you should also check out the Skype Voice Changer download at LO4D.com which includes virus and malware tests. Additional screenshots of this application download may be available, too. 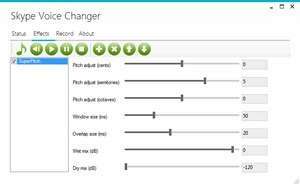 Skype Voice Changer download been highly rated by our users.